« Against All Odds is a mechanism that produces thoughts, ideas and actions, abbreviated to AAO. What is the AAO: Ethics / Aesthetics? AAO: Ethics / Aesthetics is a series of actions and events that produces thoughts and ideas on the correlation between ethics and aesthetics. What is the objective of AAO: Ethics / Aesthetics? 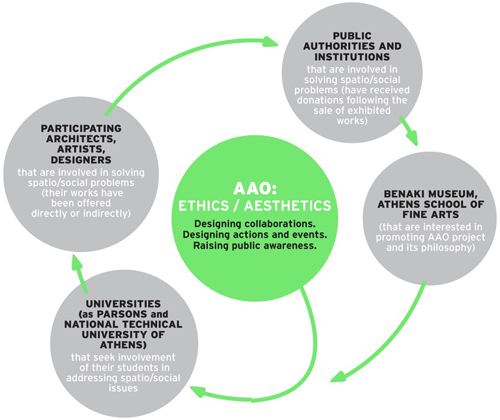 The objective of the AAO: Ethics / Aesthetics is to explore the moral values related to spatial practices and to communicate the conclusions to the public. In particular, Ethics / Aesthetics aims to promote the current social dimension of Architecture through the expansive analogies with Design and Art; and by enhancing the field of Architecture, to suggest solutions on social and ecological issues – both in relation to public realm and the improvement of daily life. How does AAO: Ethics / Aesthetics act? Which is the program of AAO: Ethics / Aesthetics ? The interaction between ethics and aesthetics unfolds in series of events reflecting an interdisciplinary approach: exhibitions, two cross-disciplinary conferences, workshops and various other performance-actions. Through diverse cooperative groups consisting of specialists in the fields of architecture, design and art, progressive and innovative works become a medium in order to enhance multiple facets of social employment, ecological sensitivity and of the need for the environment protection.